Draguignan, situated in the Var's inland region, was once its capital and at the last census in 1999, had a population of 34,814 (this is currently more likely to be around the 40,000 mark, in 2008). It's a friendly town, not surprising for one that receives 300 days of sunshine a year. The town is very spacious with picturesque tree-lined boulevards encircling the historic old town with its ancient provincial housing. About 15 years ago Draguignan was the recipient of bad publicity after a right wing mayor came to office determined to privatise everything. Consequently, the town descended into bankruptcy. Today, however, the economy has picked up and prices are stable again. Draguignan is still viewed as a highly commercial town offering plenty to do for any age range. The French military have made a home in Draguignan, residing in a number of barracks around the town. The plains to the north are often used as firing ranges and mock battlegrounds. 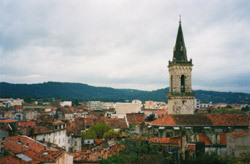 The town's longstanding reputation as a military town appears to be overtaken by the tourist industry, which has recognised Draguignan's potential. There is a wide choice of museums around the town. The most interesting is the Musee des Arts et Traditions Populaire de Moyenne Provence. It showcases all the old industries of the Var department, such as silk, honey, cork, olive oil and tile making along with explanations of local customs. There are plenty of options when it comes to eating, no matter what size your budget is. The centre of town seems to mainly cater for fine food, while, if you head into the Old Town, you'll find anything from creperies to pizzerias. If you're eager to explore the Gorges du Verdon then Draguignan seems the best place to start. The bus station has services that will take you to Les Arcs from where you can get a bus to anywhere else along the tourist trail. Hiring a bike is another great way to get there. Simply ask at the Tourist Information Centre for details. The nearest airports are Nice, Toulon and Marseille. Easyjet fly to all three from Gatwick. British Airways fly to Nice from Heathrow while British Midland flies there from East Midlands, Flybe make the journey from Southampton and Jet2 fly there from Leeds and Bradford. GB Airways operates flights into Toulon from Gatwick. If you'd prefer not to fly, Rail Europe will take you from the UK all the way to Cannes. Draguignan has cheaper homes than in the main cities of the Var yet still features a healthy rental market. At the time of writing we have a large three-bedroom villa with a pool and tennis court for €610,000. Do you know Draguignan better than we do? 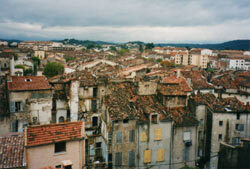 Do you have photos of Draguignan? Towards the north east of the Var department's centre. Access: Nearest airports are Nice, Toulon and Marseille. Rail Europe operates trains from the UK to Cannes. Economy: Tourism and the presence of the military are responsible for a sizeable part of the local economy. Interesting fact: The town receives 300 days of sunshine a year.